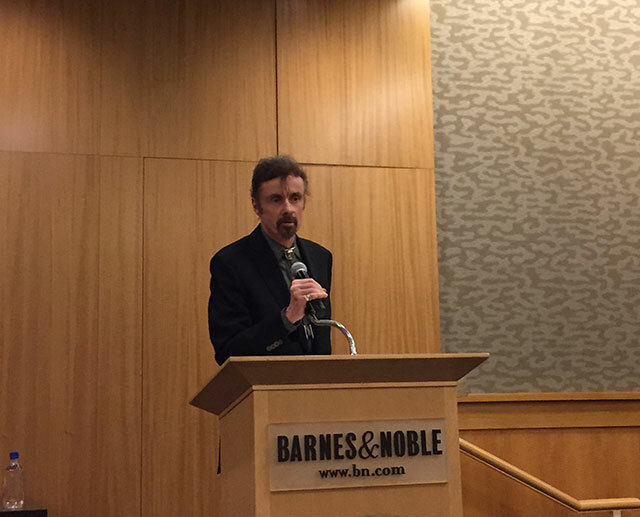 T.C Boyle discussed his latest novel, The Harder They Come, at Barnes and Noble on 86th Street last week. The book is the twenty-fifth book from the author. Boyle spent the first two decades of his life East of the Hudson River. Sometime in his twenties he says he finally crossed the river. He he has since relocated to California where he is a faculty member at the University of Southern California. The move has influenced his writing and the state serves as a setting for the latest novel. Boyle found inspiration for The Harder They Come in the news. He calls it “utterly depressing” to read the newspaper. The book is about guns, and a gunman who shoots people. For Boyle, writing is an important way of contemplating issues. “Its the only way I know how to think deeply,” he says. He delivered a draft of the book in the fall of 2013. Six months later, a gunman opened fire at Boyle’s campus at USC. He was fortunate to have been three thousand miles away in upstate New York at the time. However, despite drawing on real news, Boyle has written a fictional novel. “I’m not the kind of writer who works from a journalistic background,” he says. He doesn’t interview subjects, he never visited Fort Bragg. The one bit of research he did for the novel was to go into the national forest and wander around. He says on his hikes there were times he didn’t see a single living creature, not even insects. The fiction Boyle writes evolves organically, he says. He doesn’t work with an outline. The one thing he starts with is a title. From that point he writes and allows the text to grow. Each of his books also ends up with a pattern, a logical progression. These too he finds through writing. “I like to discover that pattern,” he says. In the case of The Harder They Come, the pattern follows a cycle of taking the perspective of each of three characters. Boyle keeps a rigorous writing schedule beginning most mornings at tenand working until two or three in the afternoon. When he finishes for the day, he turns off his computer and other electronics to distance himself. “I think you can press too hard sometimes,” he says, and then adding, “Every book, the middle is the hardest part.” The only time he isn’t really writing is during his book tours, although even then he’ll bring some light research materials. His upcoming novel is set in the Arizona biosphere, the self-contained greenhouse designed to test suitability for life in contained environments. His terranaughts, as he refers to them, are entering the biosphere for a second attempt at completing the mission of remaining isolated in the structure. Only one such attempt was actually made when the biosphere was first built, and the experiment ended in failure. That novel is expected next year.